Also known as "The Weird World of Baseball," this 40-card set blends drawings and trivia questions into something like a rotating display of newspaper comics. 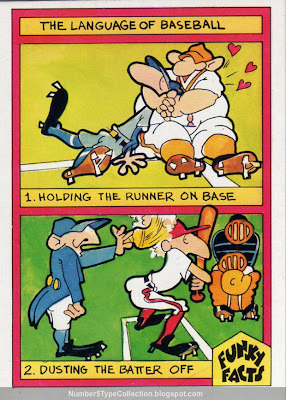 Card #5 sticks to elementary visual puns about man hugs and overly clean umpires. Funky Sales Corp--apparently their real name--packaged it like regular baseball sets, 10 cards per pack and 36 packs to a box. Based on this card, I'd be very wary of spending time or money collecting it. OldBaseball.com includes the full checklist, but card names like "Umps are Human Too" and "Not in Shape" sound as dry as "Baseballeese" proved to be. The editor clearly missed something and swapped the "answers" for #1 and #2 on the card back. 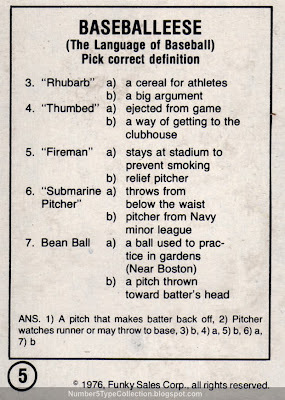 Aside from that gaffe, anyone even vaguely familiar with baseball should clean up on the other 5 questions. Value: Thanks to eBay, you can buy unopened boxes of Funky Facts for less than $20. (I assume a bunch of sealed packs and box went unsold.) Singles should also cost very small money. Fake / Reprints: Haven't seen any in the market and I doubt anyone could rationalize reprinting Funky Facts cards.